The pattern contains two versions of the design: a sweet summer tee and a lacy long-sleeved pullover worked in the round from the top down. The samples were knitted in a gorgeous alpaca blend yarn, which can give warmth despite all those yarn-overs. 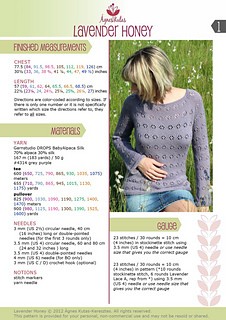 If you want to wear the tee or the sweater in summer, I suggest choosing a cooler fibre (e.g. cotton). Shown in size 84 cm (33 inches) with 1 cm negative ease. Seamless, knitted from the top down.